Let me preface this by saying running shoes are an incredibly subjective product full of nuance. With factors that include your running experience, body type, gait, the arch and width of your feet, if you pronate or supinate, how often you run, your preferred distance, and the surface you run on. There should be no expectation that what works for one person will work for another (read: wear a shoe that works for you). That said, the Brooks PureFlow has been my running shoe of choice for the last three years, and with its lightweight, cushiony ride, I think it can go the distance for novice and competitive runners alike. The Brooks Pure Flow performs well in any race, from the mile to the marathon, meaning I can train and compete confidently in a single shoe. And I use them for my long runs, tempo runs, speed work, and recovery days, all without a performance dip. The PureFlow walks the line as a light, fast shoe for experienced racers as well as one with enough cushion for the untrained runner acclimating to the increased impact on their legs. So while the PureFlow can’t account for every aforementioned nuance, it can please a wide range of people. 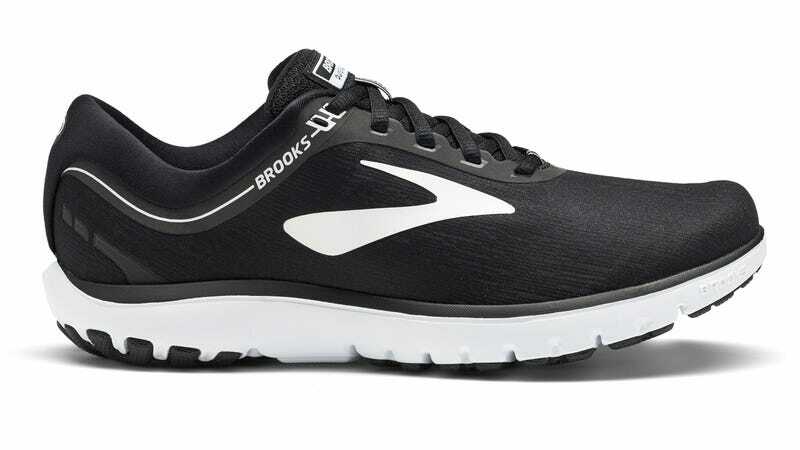 With the 7, Brooks has kept the PureFlow light at 8.9oz, without sacrificing support. While they won’t coddle your feet with excess cushion, they’ll maintain a comfortable ride and responsiveness during their lifetime thanks to the BioMoGo DNA midsole. Basically, this proprietary material efficiently and evenly disperses pressure throughout the incredibly flexible sole. You get the soft response you need without the bulk. The PureFlow is part of Brooks’ Connect line of shoes, meaning it’s a neutral shoe that’s supposed to help you ‘connect’ with the ground. Hence they feature a minimal 4mm drop (the drop from the heel to the toe), which is a personal preference of mine. It’s closer to what mother nature intended (barefoot, 0mm drop) and further from the less natural hefty heel structure (8-12mm drop) that is so common now. Finally, the upper. It’s the most noticeably changed part of the 7 from previous models. It’s essentially a single piece of their 3D screen printed fabric that feels a bit like a bootie. The tongue is a bit more minimal on the 7 while the toe cap is better reinforced so the small but annoying problem of creasing, from past iterations, is eliminated. Oh, and it doesn’t hurt that the 7s are a lot slicker looking than most running shoes. They even look fast! Overall, the PureFlow continues to impress with the 7, offering minor enhancements and not overhauls, that would reinvent an already well-liked shoe (an all too common occurrence with running shoes). The PureFlow lets me race every distance and handle every workout comfortably without having to think about my shoes. And that’s how it should be. The PureFlow 7 is available now for $100 in men’s and women’s, but if you want a deal, the 6s (men’s only it looks like) are just $65 and still a great run.